I thought I might pause a moment and take time to answer a faithful reader's question. It seems a fine pursuit on a day when the weather is so unmustachely. 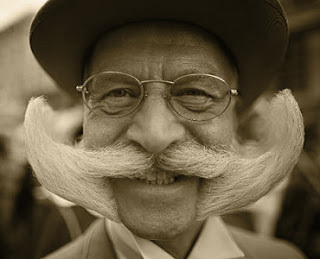 as someone struggling with a long-ish moustache, i just have to ask: good LORD, how did this man EAT?? i am constantly getting food in my 'stache, or 'stache in my food, or both in my mouth... it's en embarrassing spectacle to live through, and probably even worse for those around me to watch. i'm considering either (gasp!) shaving off my moustache in 2008, or staying indoors and eating alone forever. how in the world did men from that era get so huge with moustaches so robust -- it boggles the mind. 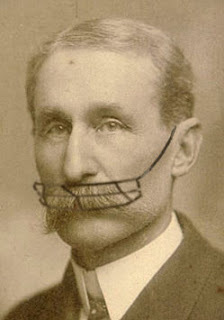 To your question: There were two main methods by which a Victorian gentleman might deal with his mustache at mealtime. For formal occasions is was common to style the whiskers up and away from the mouth for the sake of neatness and expediency. Since formal mustache portraits would rarely be shot at dinner parties, a modern example with have to suffice. A different method was often employed privately in the home or at sup with intimates, the humble face cage. Its purpose was to lift and separate the mustache, holding it out of the way to admit the various cold meat forks or monkey spoons one might wish to employ. No Victorian gentleman would have allowed himself to be photographed in his face cage; it would be as unthinkable as a lady displaying her whalebone bustle for an albuminist. So, unfortunately, all I can offer for visual reference is this crude Photo-Shoppe recreation. wow, i am humbled by your devotion of an entire post to my babbling, the honesty of my question notwithstanding! thank you once again for enlightening me -- fear not! no razor has touched my own moustache in ought-eight so far! i am taking the picture of the gentlemen with the upswept white whiskers as a sign that i must take cheer and carry on. i will find a way to continue gaining sustenance and maintaining my moustache food-free at the same time. it's the least i can do to honor our noble ancestors, and you for taking the time to put together this fantastic catalogue. i tip my chapeau to you, good sir. I must commend the series for its meticulous reconstruction of the device.